Portland's offense was firing on all cylinders, as every starter reached base during its 20-hit, 13-5 rout of the New Britain Rock Cats (MIN). Five different players had three hits for the Sea Dogs and unsurprisingly, one of those was Mookie Betts. The second baseman raised his average back over .400, going 3 for 5 with a home run, walk, stolen base, three runs scored and three driven in. It was Betts' sixth homer of the year, and he now has 18 stolen bases. Henry Ramos had three hits of his own, including a double and a triple. Since the calendar flipped to May, Ramos has been even more dominant than Betts, posting an incredible .460/.500/.720 line in 13 games. Travis Shaw was 3 for 6, raising his average over .300 for the first time this season. Derrik Gibson and Shannon Wilkerson also had three hits apiece. Brian Johnson struggled with his control in his worst start since his promotion to Double-A. The left-hander allowed three runs (two earned) on three hits in five innings, striking out three and walking five. Johnson came into the start having only issued one walk in his two previous Portland appearances, and only eight in his seven starts across two levels. Matty Ott was the beneficiary of the offense's six-run outburst in the seventh, as he picked up the win despite allowing two runs on four hits in two innings. Mike McCarthy closed out the win with two scoreless frames. Salem's game against the Carolina Mudcats (CLE) was postponed by rain. The teams will play a doubleheader on Friday at 5:00pm. Greenville's doubleheader with the Savannah Sand Gnats (NYM) was also rained out. They will make up one of those two games as part of a doubleheader on Friday. The other contest has been cancelled, as Friday is the last meeting of the first half between the two clubs. Player of the Day: While there were a number of worthy offensive performances to consider, the nod goes to Anthony Ranaudo. 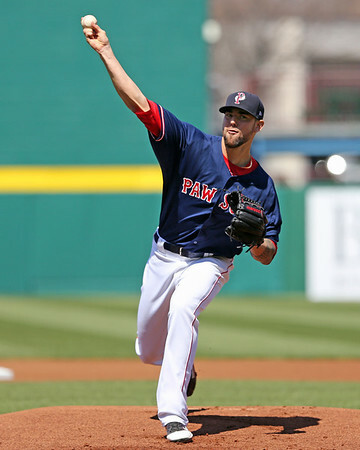 The former LSU Tiger was excellent for the PawSox, spinning seven innings of shutout baseball. It was the first time Ranaudo went seven full innings in 15 Pawtucket appearances going back to last August. Since joining the PawSox, he is 7-3 with a 3.27 ERA.